Is It Time to Restore Your Crawl? When was the last time you visited the crawl space underneath your home? If it’s been a while since you’ve ventured down to take a look, it is probably a good idea to check it out. The truth is, your crawl space should be treated like the rest of the home and monitored for maintenance issues, excessive moisture, evidence of mold/mildew, etc. The primary purpose of a crawl space is to promote air circulation through the home and also allow easy access to plumbing, electrical and other such maintenance, repair and installation needs. Crawls offer an expedient and efficient way to access pipes and other areas that may be difficult or expensive to reach otherwise. 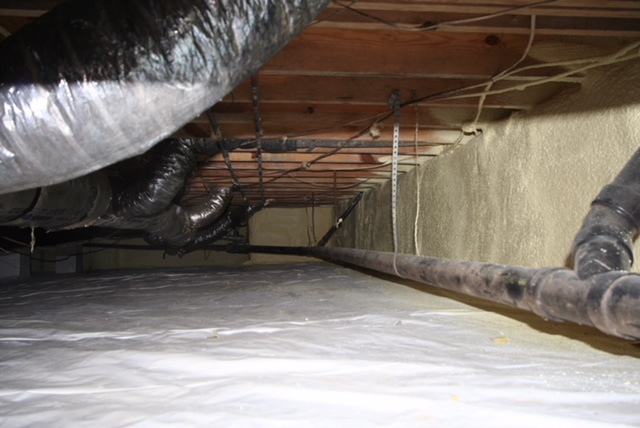 Older homes in areas where basements are rare have high foundations with crawl spaces that allow cooling air to circulate throughout the home. Though a crawl space cannot be utilized as a living space, it can be used for storage of infrequently used items. This requires caution on the part of the homeowner, because moisture from the damp soil, along with humidity from crawl space vents and water seeping through permeable concrete, can and will create a breeding ground for mold and mildew. Overall, a crawlspace can serve a variety of purposes, not the least of which is the actual foundation of a home. This is why it’s important to keep an eye on potential issues that can occur in the crawl space. Crawl space restoration can stop moisture permanently in conditioned or ventilated crawl spaces, as well as basements. Now is a great time to let us take a look at your crawl space, before the weather gets too cold. Let us transform your crawl space into a clean and healthy area of your home. Call our team of professionals for a free consultation today! This entry was posted in conditioned crawl space, Energy Conservation, Energy Saving, Home Comfort, Insulation, Sealed Crawl, Spray foam and tagged ashland, ashland va, conditioned crawl, conditioned crawl space, crawl space, crawl space repair, crawl space restoration, creative conservation, energy efficient, insulation. Bookmark the permalink.